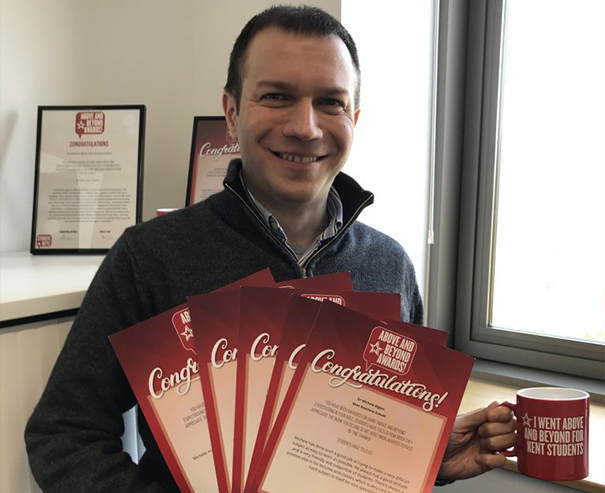 Kent Business School’s Senior Lecturer in Accounting, Dr Michele Bigoni has won the Above and Beyond Award for the third consecutive year. The Above and Beyond Awards were launched by Kent Union to celebrate outstanding members of staff, both academic and non-academic. Students nominate staff who they believe have gone above and beyond in their role. ‘I am extremely pleased with this award and grateful to my wonderful students. It has been another very positive and rewarding year for me, the success and enthusiasm of my students is certainly the best part of this job. Receiving this extraordinary recognition for three consecutive years means that I am consistently meeting my students’ expectations, which is always the main challenge for a lecturer. I am particularly pleased to see that students feel I am contributing to enhancing their knowledge and employability in an innovative way. The award is a further incentive to do my best to make my students’ time at the University of Kent as productive and enjoyable as possible.’ – Dr Michele Bigoni. Congratulations to Michele from all at Kent Business School. Dr Bigoni is the module convener for AC521 Management Accounting 1 module, part of the Kent Business School BA Accounting and Finance programme. As well as this he is the module convenor for CB937 Financial and Management Accounting, a masters’ level module offered to students from different pathways, including MSc Management and MSc Marketing. If you know a member of staff who has gone above and beyond for students, you can nominate them here.